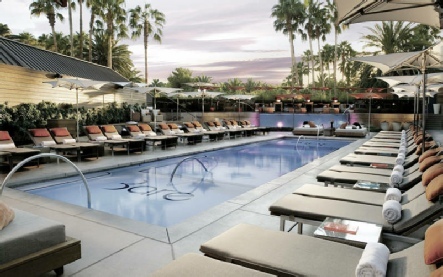 Right at the heart of all the action, in a central location on the Strip. 3,044 rooms, mini-bar, 42” flat-screen TV, MP3 dock, Internet (charge), air-con, 24hr room service. 13 restaurants & coffee shops, 4 bars & lounges, 2 nightclubs, showroom, casino, large tropical outdoor swimming pool, 2 whirlpools, sauna, steam & spa (charge), dolphin & tiger habitat (charge). A huge saltwater aquarium that’s home to eels, sharks, stingrays and other exotic sea creatures sits behind the front desk. In Siegfried and Roy’s Secret Garden you’ll come face to face with dolphins, panthers, leopards and beautiful white tigers. The Mirage also boasts a huge tropically-styled swimming pool oasis and plays host to the show ‘LOVE’, a unique fusion of Cirque du Soleil® and music from the Beatles. The Polynesian-themed Mirage puts you right at the heart of all the action on the Strip. The hotel’s famous Volcano Show, complete with erupting molten lava, has been a guaranteed crowd-pleaser for years, and the tropical atrium lobby is filled with fragrant blooms, soothing waterfalls. 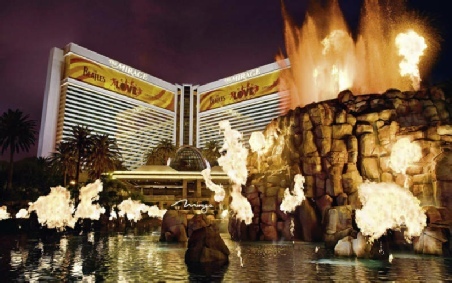 2019 package holidays to the Mirage Resort & Casino, Las Vegas Prices are per person based on two sharing, including flights and accommodation (plus transfers in Caribbean destinations), and are subject to availability. Flights from Gatwick - other departures also available, call for details.